MR J. NEIL GREY OF MILFIELD The death occurred with painful suddenness on Saturday at Milfield, of Mr John Neil Grey, eldest son of the late Mr George Grey and of Mrs Grey of Milfield. The deceased gentleman, who was in his 45th year, recently returned from a holiday visit to the West Indies. 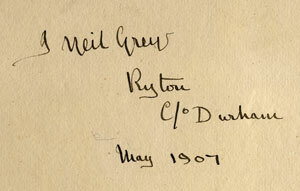 He was a grandson of Mr John Grey, Dilston once so well known in agricultural circles. 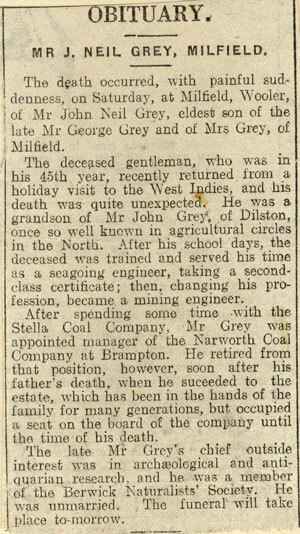 After his school days, the deceased was trained and served his time as a seagoing engineer, taking a second-class certificate; then, changing his profession, became a mining engineer. 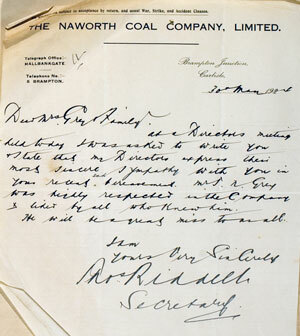 After spending some time with the Stella Coal Company, Mr Grey was appointed manager of the Naworth Coal Company at Brampton. He retired from that position, however, soon after his father’s death, when he succeeded the estate, which has been in the hands of the family for many generations, but occupied a seat on the board of the company until the time of his death. The late Mr Grey’s chief outside interest was in archaeological and antiquarian research, and he was a member of the Berwickshire Naturalists' Society. He was unmarried. COMING OF AGE FESTIVITIES AT MILFIELD. On Tuesday the village Milfield was " en fete” in celebration of the coming of age of Mr. John Neil Grey, the oldest son of Mr. Grey of Milfield. The whole village was gay with bunting and from the flagstaff floated the red ensign which the villagers subscribed for a year ago for use on such special occasions as the present. 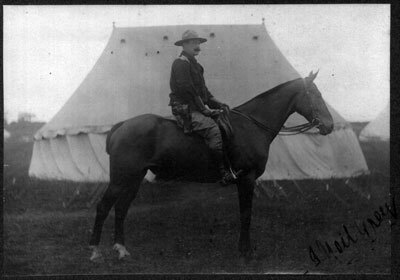 Mr. J. N. Grey was born on Nov. 7th, 1879, and had therefore completed his 21st year nearly two months ago, but on account of his absence from home on professional duty, the festivities in connection with the event were postponed until now. In the evening the tenants on the Milfield estate and the villagers and employees were entertained to supper, which was followed by a ball in the schoolroom, opened by Mr. J. N. Grey and Miss. Henderson. Both supper room and ballroom were profusely decorated, the ball room especially being very gorgeously got up under the superintendence of Mr. Hunter. Supper was laid for 120 and fully 200 people attended the dance." Mining Engineer, Surveyor and Colliery Manager. Died 24 May 1924 at Milfield. 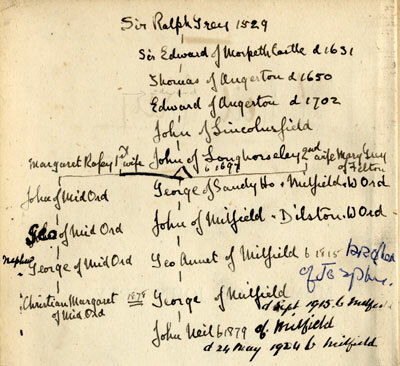 Jock inherited Milfield on the death of his father George on 18 September 1915. When Jock died it passed to his younger brother Ivar. Left: Jock lying at front of group. The uniform does not appear to be a British regiment. It could be a yeomanry cavalry regiment. 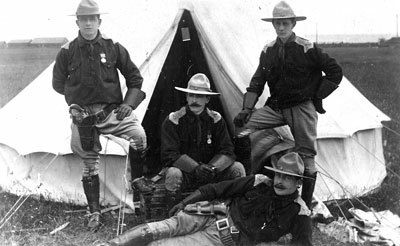 The medals worn by the men behind are Boer war medals, South Africa medals from 1898-1901. The guns are Smith and Wessons. The top photograph is by a photographer at Whitley Bay. May 26 1924 Mrs Grey Milfield Wooler Dear Madam, I have been asked by the officials of the Collieries to convey to you our sincere sympathy with you in your bereavement. Mr Grey earned the highest regard of us all and we share with you the great loss you have sustained. Yours truly FHY Adams. 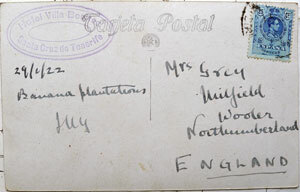 NAWORTH COAL COMPANY, LIMITED, Brampton Junction, Carlisle 30 May 1924 Dear Mrs Grey and Family. At a directors meeting held today I was asked to write you and state this my Directors express their most sincere sympathy with you in your recent sad bereavement. Mr J N Grey was highly respected in the Company & liked by all who knew him. He will be a great loss to us all. I am yours very sincerely Mrs Riddell, Secretary. 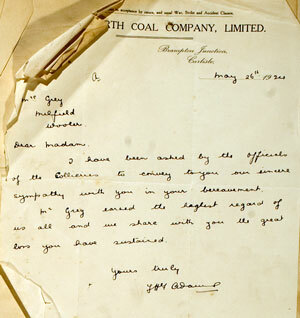 He achieved his certificate of competency as manager of mines on 11 June 1908. 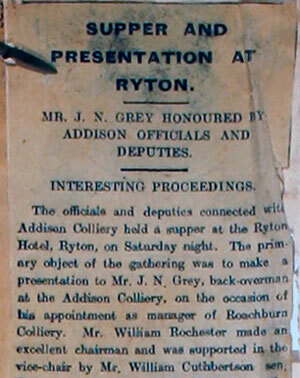 11 Feb. 1911 The Stella Coal Company presented him with a silver plated spirit stand, case of pipes and a silver mounted walking stick as he left Addison Colliery to go to Roachburn Colliery. A number of long speeches were recorded. 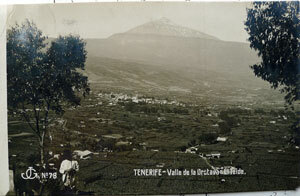 He acquired a qualification in surveying mines on 17 July 1912. He became a manager of "Gairs" at Brampton Cumberland, and "Midgeholme, Whitescut" mines owned by the Naworth Coal Company in 1914, and of two other mines Howard and Venture by 1918. He was managing Director by 1923. The Durham Mining Museum has this information here. He was the first child of George and Christian Grey. 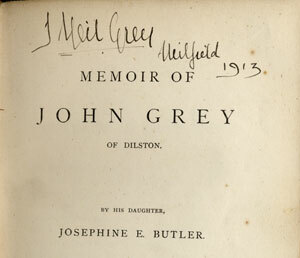 Above: Jock's signature in a copy of Josephine's Butler's book. Right: His family tree in the front of the same book. Jock was interested in history, genealogy and heraldry. Left: one of his drawings. 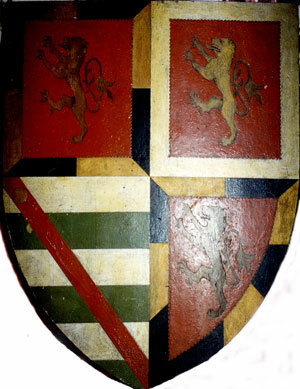 Below: a wooden shield that he made after his brother Ivar married Kathleen Blake. In September 1915, when his father died, he was living at Williamgill House, Brampton Junction, Cumberland. In early 1918 he was responsible for the probate of Charles William Dixon-Johnson's will. 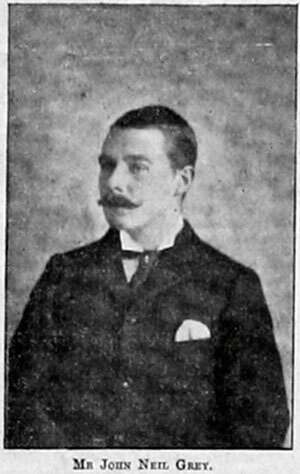 Charlie had married Jock's sister Freddie and had been killed in Flanders. Ships passengers lists record him aged 45, and his brother Charles Boyd, aged 35, arriving in New York on 4 May 1924, on board the Parima which had arrived from Dominica in the West Indies. Hunting Horn with initials J.N.G. 1894, when he was 15 years old. Made by Kohler & Son, Victoria Street, Westminster. Thanks to Bob Evers. Right: A note about leave from SS Ratho Cape Town. Perhaps during his time as a sea going engineer? Was it a transport ship for the Boer war? THE S. S. RATHO. The steamer Ratho, which arrived at Sydney on Saturday from Port Pirtie, is a fine specimen of the modern cargo carrier. She was built and engined by the Palmer Shipbuilding Company; Newcastle-on-Tyne, and launched in December last. She is constructed of steel and her dimensions are: - Length, 383ft 8in; beam, 45ft 2in; and depth of hold 27ft 8in. Her net register is 2708 tons and gross measurement 4246 tons. Besides being a great carrier the Ratho also steams well on a moderate consumption of fuel. Her engines,are on the triple expansion principle, the cylinders being 26ft, 43in; and 63in in diameter respectively, and the length of stroke 45in. The Ratho is equipped with modern labour saving appliances, and has Lloyd's highest class. The owners of the steamer are the Caledonia S. S. Company. BE IT KNOWN that John Neil Grey of Milfield Wooler in the County of Northumberland who at the time of his death had a fixed abode at Milfield aforesaid within the District of the COUNTY OF NORTHUMBERLAND, died there on the 24th day of May 1924 AND BE IT FURTHER KNOWN that at the date hereunder written the last will and Testament of the said deceased was proved and registered in the District Probate Registry of His Majesty’s High Court of Justice at NEWCASTLE-UPON-TYNE and that administration of all the estate which by law devolves to and vests in the personal representative of the said deceased was granted by the aforesaid Court to Charles Boyd Grey of Milfield aforesaid, Esquire, brother of deceased, and Charles Davison Forster of Newcastle-upon-Tyne, clerk of the Peace for Northumberland the surviving Executors named in the said Will. Dated the 14 day of May 1925. Resworn £49524-10-09 Gross value of Estate ……£49,262:0:11 Net value of Personal Estate £1,009:16:3 Extracted by C. D. Forster and Lester, Solicitors Newcastle upon Tyne. I John Neil Grey of Milfield in the county of Northumberland Esquire hereby revoke all former wills codicils and testamentary instruments made by me and declare this to be my last Will I appoint my brother Charles Boyd Grey my brother-in-law Charles William Dixon-Johnson and Charles Davison Forster of the city and county of Newcastle on Tyne Solicitor (hereinafter called "my Trustees") to be Executors and Trustees of this my will and I declare that the expression “my Trustees” shall include the said Charles Boyd Grey Charles William Dixon-Johnson and Charles Davison Forster and the survivors or survivor of them or other the Trustees or Trustee for the time being of this my will when the context so requires or admits I appoint my Trustees to be Trustees of the settlement made by this my will for the purposes of section 42 of the Conveyancing and Law of Property Act 1881 and for the purposes of the Settled Land Acts 1882 to 1890 I devise the messuage or dwelling-house situate at Milfield aforesaid and called or known as Meldon Burn House with the garden and appurtenances thereunto belonging as formerly in the occupation of John Clark to my mother Christian Margaret Grey during her life without impeachment of waste I devise all my real estate situated at or near Milfield aforesaid including Meldon Burn House and premises but as to the said house and premises subject to my mother's life interest therein to the uses following: – (1) To the use of my brother George Henry Ivar Grey during his life with remainder (2) To the use of his first and other sons successively according to seniority in tail male and so that an elder son of my said brother and his issue male shall always take before a younger son of my said brother and his issue male with remainder (3) To the use of my brother Eric Ida Grey during his life with remainder (4) To the use of his first and other sons successively according to seniority in tail male and so that an elder son of my said brother and his issue male shall always take before a younger son of my said brother and his issue male with remainder (5) To the use of my brother the said Charles Boyd Grey during his life with remainder (6) To the use of his first and other sons successively according to seniority in tail male and so that an elder son of my said brother and his issue male shall always take before a younger son of my said brother and his issue male with remainder (7) To the use of my brother Gervase Minto Grey during his life with remainder (8) To the use of his first and other sons successively according to seniority in tail male and so that an elder son of my said brother and his issue male shall always take before a younger son of my said brother and his issue male with remainder (9) To the use of my sister Christian Elfreda Dixon-Johnson during her life with remainder (10) To the use of her first and other sons successively according to seniority in tail male and so that an elder son of my said sister and his issue male shall always take before a younger son of my said sister and his issue male with remainder (11) to the use of my sister Mary Lizette Grey during her life with remainder (12) To the use of her first and other sons successively according to seniority in tail male and so that an elder son of my said sister and his issue male shall always take before a younger son of my said sister and his issue male with remainder (13) To the use of my relative Ralph Grey a son of my grand uncle Charles Grey Grey during his life with remainder (14) To the use of his first and other sons successively according to seniority in tail male and so that an elder son of my said brother and his issue male shall always take before a younger son of my said brother and his issue male with remainder (15) To the use of my relative Charles Grey another son of the said Charles Grey Grey during his life with remainder (16) To the use of his first and other sons successively according to seniority in tail male and so that an elder son of my said brother and his issue male shall always take before a younger son of my said brother and his issue male with remainder (17) To the use of my own right heirs in fee simple Provided nevertheless that every person who under the uses aforesaid (including the divesting limitations in this clause contained) shall become entitled in possession to my Milfield estate as tenant for life or in tail male by purchase and shall not then use the name and arms of Grey shall within one year thereafter (or if an infant within one year after attaining majority) and every husband of any such female person shall within one year after such person shall become so entitled in possession or within one year after their marriage (whichever event shall last happen) endeavour to procure the Royal Licence to take such name either alone or suffixed (but not prefixed) to his or her previous surname and to use such arms either alone or quartered with his or her own arms and if such application be successful shall thenceforth use such a name and arms for all purposes And in default of compliance with this condition or in case of subsequent discontinuance of the use of such name and arms by such person or in the case of a married woman by her husband (as the case may be) the uses hereinbefore limited favour of such person shall determine and become void as if such person or his wife (as the case may be) were then dead and if tenant in tail male there was a general failure of his or her issue Provided always that if such person be under such uses only tenant for life then during the rest of his or her life the said estate shall go to the use of my Trustees upon trust to receive the rents and profits thereof for the benefit of the person or persons who under the uses following the said use to such tenant for life hereinbefore contained would for the time being be entitled to the possession of the same estate but for this present trust I declare that the person or persons who shall for the time being constitute or be the tenant for life or have the powers of a tenant for life of the settlement created by the devise in strict settlement hereinbefore contained within the meaning of the Settled Lands Acts 1882 to 1890 may exercise over or in relation to the settled hereditaments hereby devised in strict settlement or for the time being subject to the subsisting uses or trusts of the said settlement power to concur with the mortgagee or mortgages for the time being of the settled hereditaments or any part or parts thereof to vary the terms of the mortgage or mortgages in all or any of the manners following that is to say by changing the rate of interest and the days on which interest shall be payable or the events on which the powers of sale and of appointing a receiver shall be exercisable or by making or revoking existing provision for the reduction of interest on punctual payment or the continuance of any loan for a term certain or by conferring on the mortgagee or mortgagees any additional remedies or powers but so that every such remedy or power shall be such as might be conferred by a mortgage executed by a tenant for life under the powers of mortgaging by statute vested in him And also power at any time or times to mortgage all or any part of the settled hereditaments by way of collateral or substituted security for any mortgage then existing thereon or on any part thereof and also to concur with several mortgagees in allowing the priority of moneys secured or charged by their respective mortgages I bequeath free of duty of every kind to such one of my said brothers who shall immediately on my death succeed me as tenant for life in possession of my said estate at Milfield all household furniture plate linen books pictures china and other household effects motor cars carriages and live and dead stock belonging to me and at the time of my death in or about my house or estate at Milfield aforesaid I devise and bequeath all the real and personal property whatsoever and wheresoever of or to which I shall be seised possessed or entitled at any death or over which I shall then have a general power of appointment or disposition by will except property otherwise disposed of by this my Will or any Codicil hereto but subject to and after payment of my funeral and testamentary expenses and debts and the legacies and annuities bequeathed by this my Will or any Codicil hereto and the duty on any legacies and annuities bequeathed free of duty unto and to the use of my Trustees upon trust to pay the income thereof to my said mother Christian Margaret Grey during her life And after her death to hold the said trust premises and the income thereof upon trust to apply the same in the same manner as if the said trust premises had been capital moneys arising from a sale of all or part of the hereditaments hereby settled in strict settlement In witness thereof I have to this my Will set my hand this 31st day of December one thousand nine hundred and fifteen. Signed by the said Testator John Neil Grey as and for his last will in the presence of us present at the same time who at his request in his presence and in the presence of each other have hereunto subscribed our names as witnesses C. Lacy Thompson Farlam Hall Brampton Junction Cumberland Gentleman James Smith Farlam Hall Brampton Junction Cumberland Footman On the 14 th day of May 1925 probate of this Will was granted at Newcastle-upon-Tyne to Charles Boyd Grey and Charles Davison Forster the surviving Executors. , we have Earl Grey who has thoroughly at heart the social welfare of the people,and who busies himself in doing all that he can to promote the well-being of the people. And there is Sir Edward Grey, already a famous statesman and of whom I need to say no more, so well-known is he to all of us. The branch of the family from which our worthy chairman has sprung has not perhaps given to the country any great statesmen, but it has given what is not less important, famous agriculturists with world-wide reputations. (Loud applause.) I ask you ladies and gentlemen to drink Mr and Mrs Grey’s very good health, and we wish them every happiness in the years to come and hope that 21 years hence they may be as young as they are today. (Loud and continued applause and "He's a jolly good fellow.") Mr Grey, who was again loudly cheered on rising to reply, said: Mr Hunter ladies and gentlemen, Mrs Grey and myself are deeply grateful for the very eulogistic terms in which Mr Hunter has proposed our healths, and for the way in which you have drunk them. I fear we would run the risk of becoming unduly proud if we took all these exceedingly kind expressions as being strictly in accordance with the truth. Yet I will say that as far as our married life is concerned, it has been all that Mr Hunter says. It has been an exceedingly happy one, and we are very grateful that we have been permitted to see our eldest son come of age. I sometimes am half inclined to wish – in these disastrous times especially – that I could go back to the times Mr Hunter spoke of, when my ancestors were wardens of Wark and Norham. It would have been an exceedingly handy way of replenishing one's foldyards to slip across to the rich Merse of Berwickshire or to the neighbouring county of Roxburgh and take what we wanted, instead of having to go to Berwick market and pay big prices out of empty pockets, and, moreover, the cattle we used to get so easily in those days were grand beasts, not the stirks we have to be content with now-a-days. We cannot afford to buy such animals now, and we dare not go over the border to fetch them, more’s the pity. (Loud laughter). I sometimes doubt whether with all the civilisation which we now possess, we are as happy now as were our forefathers in the rieving days. They lived from hand to mouth, it is true, but there were no class distinctions – all were hand and glove with one another – all formed one large family. If the chief fell, the whole clan fell with him. There was in those days no wages question, and none of the many ills which now bother us. Foreign lands possessed no attractions, and all were content to spend their days where they were born, harrying and thieving and getting what they could. (Applause) Ladies and gentlemen, for Mrs Grey and myself I thank you most heartily for having done us the honour of coming here to celebrate this event with us. I assure you that we are deeply grateful, and I hope that on some future occasion, when we may possibly be having another son coming of age, we may again have the pleasure of seeing you here. (Loud applause). The following presents were received by Mr J. N. Grey: – Mrs Rea, silver flask; Mr Rea, cigarette case; Mr Grey, silver flask; Mr Boyd Grey, silver match box; Miss Mary Grey, knife; Miss Grey, cigarette case; Mr Eric Grey, gold studs; Mr Gervaise Grey, silver pencil; Mr G.H.J.Grey, cigarette case; Mr Harrison, box of mathematical instruments; Earl Grey, silver inkstand; Mrs Grey, bicycle and camera; Miss Calvert, cigar cutter; Mr C.W. Dixon Johnson, silver sovereign box; Miss Brunton and Miss Mitchell, silver cigarette case; Mrs Whillis, silver napkin ring; Mr R. Bruce, gents’ dressing bag; Mr Brand, silver mounted pocket book; Mr Stevenson, Wallsend cake; Mrs Twedell, dispatch box; Mr John Lee, inkstand; Mr J. W. B. Boyd, clock and aneroid; Mr W Lyall, ram's head; Mr G. P. Druton, a pipe. The silver bowl from the inhabitants of Milfield, was a very handsome article supplied by the Goldsmiths’ and Silversmiths’ Company. It bore the family crest and coat of arms together with the following inscription: "John Neil Grey, presented by the inhabitants of Milfield on attaining his majority, 7th Nov., 1900." 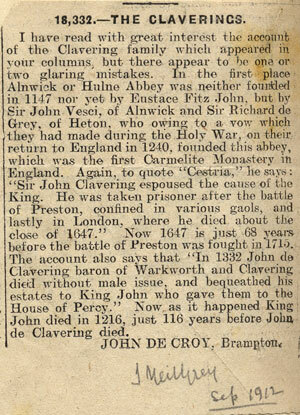 on a silver plate attached to the plinth appeared the names of the subscribers which were as follows:-J. Clark. W. E. Henderson, R. Lowrey, C. Pentland, T. A. Robson, J. Gillie, R. Fleming, J. Cleghorn, G. Marshall, R. Swan, J. Atkinson, T. Dunn, J. B. Harrison., Jane Robson, Jessie Robson, E. Taylor, M. Young, J. W. Lee, A. Telfer, J. Robson, W. Curry, R. Hardy, C. Robson, E. Rogerson, H. Walker, J. Simon, J. Marshall, C. Marshall, Jane Marshall, John Steel. 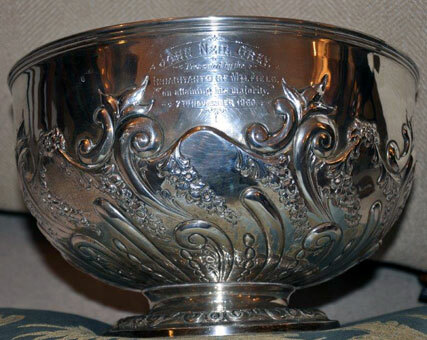 The silver bowl from the inhabitants of Milfield, was a very handsome article supplied by the Goldsmiths’ and Silversmiths’ Company. 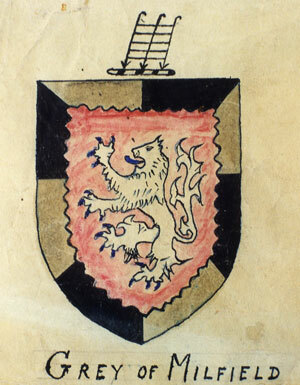 It bore the family crest and coat of arms together with the following inscription: "John Neil Grey, presented by the inhabitants of Milfield on attaining his majority, 7th Nov., 1900.